In the early 20th century, Russian botanist Nikolai Vavilov created a preserve outside St. Petersburg that today contains one of the world’s largest collections of rare seeds and crops. Now, scientists and conservationists are waging an international campaign to save the reserve’s fields from being bulldozed for housing development. Correctly surmising that this region of Kazakhstan was “the chief home of European fruit trees,” Vavilov collected the seeds of the many varieties of apple and other trees, eventually hauling them back to his scientific base in Leningrad, now St. Petersburg. at the Pavlovsk Station in 2010. The trees that sprouted from those seeds, and more than 5,000 other varieties of fruits and berries, now grow in a sprawling, 1,200-acre collection of fields about 20 miles south of St. Petersburg, not far from the opulent, 18th-century czarist palace of Pavlovsk. This living repository of trees and bushes — with Europe’s most extensive collection of fruits and berries — has been at the center of a dispute in recent months as a federal Russian housing agency has tried to confiscate part of the Pavlovsk Research Station to clear the land for upscale dachas for Russia’s burgeoning new elite. The fate of the station is now in limbo as, after an intense lobbying campaign by botanists and conservation groups around the world, Russian President Dmitri Medvedev has announced that the government is investigating the effort to uproot one of the most valuable botanical collections on Earth. The priceless nature of the Pavlosk station can be traced directly back to Vavilov and his painstaking efforts to collect seeds from what he viewed as hot spots of plant diversity around the world, now known as Vavilov Centers. His insights into the importance of preserving botanical genetic diversity, particularly among food crops, are highly relevant today as that diversity faces unparalleled threats from industrial agriculture dominated by monoculture crops, destruction of wild habitats, and climate change. The heat wave and subsequent fires that have destroyed much of Russia’s wheat harvest this year may have helped increase the chances that Vavilov’s storehouse of plants will live on at Pavlovsk. The fires triggered new fears in Russia about the nation’s ability to feed itself and the impact of global warming, and raised the profile of scientists working to protect the country’s food varieties. As the heat wave has faded, many Russians are now hoping that Pavlovsk can be saved. The Pavlovsk Research Station, part of the N.I. Vavilov Research Institute of Plant Industry, houses one of the world’s largest collections of seeds and planted crops, roughly 90 percent of which are found in no other scientific collections in the world. The station’s inventory includes almost a thousand types of strawberries from more than 40 countries; a similar number of black currant varieties from 30 countries, including North America, Europe and the Far East; 600 apple types collected from 35 countries; and more than a hundred varieties each of gooseberries, cherries, plums, red currants, and raspberries. More than half of the black currant varieties grown in Russia, the world’s leading producer, were bred at Pavlovsk. Sales of black currants in Russia are valued at more than $400 million annually. These old varieties are still needed to provide genes to protect commercial varieties against new threats ranging from pests to climate change, and to confer new attributes. Such older varieties are mostly held in trust by commercial and international institutions, either in the form of seeds held in cold storage or plantings in places like Pavlovsk. The station had seemed destined to fall victim to a drive by the Russian government to free up public land for sale to developers. Pavlovsk is in the St. Petersburg suburb of Pushkin and is increasingly surrounded by up-market apartments and holiday homes, in an area made fashionable because of its proximity to Pavlovsk, the palace built by Catherine the Great. In late 2009, the Russian Ministry of Economic Development handed over one-fifth of the station’s fields to the Federal Fund of Residential Real Estate Development, which is tasked with finding housing land. 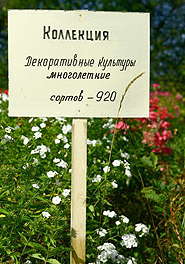 A sign at Pavlovsk marks a collection of decorative perennial plants. News that the Pavlovsk station was threatened with a state land grab first emerged over the summer. However, what looked like a done deal has attracted a high-profile international campaign that could be on the verge of success — just as the world’s governments meet in Japan next month to celebrate the International Year of Biodiversity. In any case, Fowler says the long-term intention is clear. The region’s planners have zoned the entire station for development, and the land that the federal real estate fund wants to take first is in the middle of the station’s fields. “So if they get that, it is only a question of time before the rest of the fields will be taken,” says Fowler. The station is undeniably dilapidated, and little plant breeding or research into plant genomes is now carried out there. A visit by American scientists from the U.S. Department of Agriculture, as long ago as 1975, said “the buildings are old and run down and poorly equipped… the laboratories are grossly inadequate by U.S. standards.” Stripped of funds since the collapse of the Soviet Union in 1991, parts of the station lie virtually abandoned. In other areas, the staff does little more than maintain the collection of old varieties. Even so, the collection is unique and potentially of great value. In recent years, nobody has crosschecked the station’s plants with other collections outside Russia. “It is possible that some samples are being duplicated elsewhere, but the majority are not,” says the director general of the Vavilov Institute, Nikolai Dzyubenko. Nonetheless, international authorities say the collection probably contains many genes of potentially great value in developing new commercial varieties. Many of its varieties are unusually hardy in cold temperatures and are disease-resistant. before he ran afoul of Joseph Stalin. 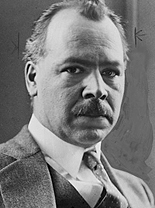 Vavilov began collecting plants across Asia in 1916, working first on wild and early cultivated varieties of wheat and other grain crops, before moving on to other crops and other continents and establishing the research stations that housed his collections. Through his travels in the Caucasus, Afghanistan, the Pamir Mountains of Central Asia, Japan, China, Korea, the Middle East, North Africa, and Latin America, Vavilov realized that cradles of botanical diversity were most often found in mountainous regions, where the many changes in topography and climate led to the evolution and development of highly diverse species. The Pavlovsk experimental station, established in 1926, is one of 11 seed banks that Vavilov created across the former Soviet Union. In the 1930s, he worked diligently to expand his collections, but as the decade wore on he ran afoul of Joseph Stalin for disputing the views of the quack scientist, Trofim Lysenko, a Stalin favorite who maintained that characteristics acquired through the environment could be inherited. Vavilov was arrested by Stalin’s secret police and thrown into the gulag, where he died of starvation in 1943. During the Nazi siege of Leningrad during World War II, scientists at Vavilov’s institute protected its collections, with some succumbing to starvation rather than consuming the collection’s rice and other crops. Crop diversity has always been the Cinderella of conservation, even though the hundreds of thousands of crop varieties bred by farmers and scientists over several millennia represent a hugely important resource. But the fight to save the Pavlovsk station has attracted a great deal of international support. Fowler launched a “Tweet Medvedev” campaign in mid-July. And top crop scientists and research organizations have added their voices to the protests, including DIVERSITAS, a network of scientists devoted to preserving biodiversity, and the International Society for Horticultural Science. Should the Russian government ignore the international outcry and move ahead with plans to develop the Pavlovsk Station, scientists are discussing the need for an emergency rescue plan. But there are serious doubts about how much of the collection could be saved. One option might have been to rush seeds from Pavlovsk to the “doomsday vault” of crop seeds from round the world, which is currently being assembled on the Norwegian island of Svalbard in the Arctic. But according to Fowler, whose job includes overseeing the vault, few of the fruits and berries held at Pavlovsk produce seeds that would survive freezing. To be saved, they would need to be planted elsewhere, a huge logistical task. With food prices skyrocketing and climate change looming, the world needs a green revolution like the one a generation ago, Fred Pearce writes. But many valuable seed varieties have been lost – and scientists now are scrambling to protect those that remain before they vanish down the genetic drain. The international campaign has clearly helped buy time for the station and may ultimately save it. Earlier this month, the federal real estate development fund announced that it had postponed the auction of the first parcel of land, intended for Sept. 23, until at least the end of October, and had set up an international scientific commission to look into the issue and make recommendations.